Argentina became the protecting power on the outbreak of hostilities on 8 December 1941. By the end of that day, the expatriate population of the compound had tripled to over 80 people. They were interned in the compound until repatriated in July 1942, via an exchange in Lourenço Marques for Japanese detainees from the UK. Thereafter, Switzerland became the protecting power and was responsible for the compound. About a dozen Japanese heads of household, mostly long service employees of the embassy, and their families lived there in the servants’ ‘village’ for the rest of the war. The Kojimachi compound, which survived the war intact, was formally re-occupied on 16 September 1945 by the British (Military) Liaison Mission. It was not until the occupation of Japan came to an end with the signing of the Japanese Peace Treaty in April 1952 that the full range of diplomatic relations could be resumed, the embassy re-constituted, and an ambassador appointed. Whereupon, the pressure on space was greater than the compound’s buildings could meet. One of the houses was converted to offices, and some sections of the embassy moved to leased premises off-compound. A three-storey house was bought in 1952 for £13,000 at 3/2-7 Chome Roppongi in Minato-Ku and adapted to the requirements of a Female Mess (later termed Ladies’ Mess) where single female embassy staff lived together, taking meals communally. This building was later converted to individual flats, and then an embassy club, and was sold at a significant profit in the early 1970s. 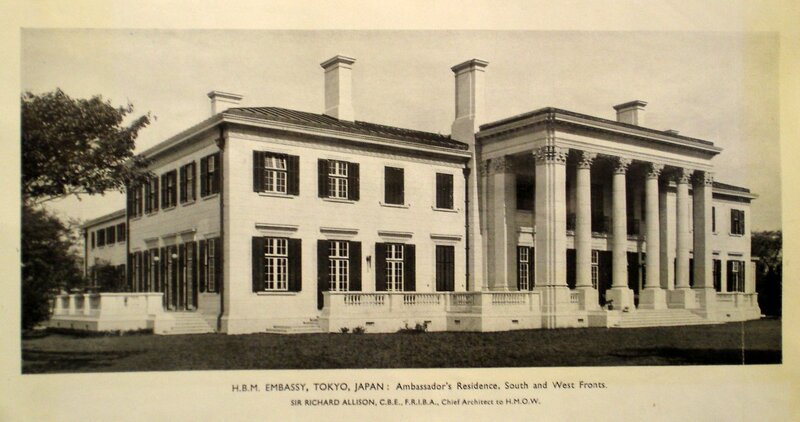 The Admiralty bought the freehold in 1952 of a timber house on a lot at 17-2 Aobadai, 2-Chome, Meguro-Ku, for their Naval Attaché. It was transferred to the Ministry in 1965, and remained as the Naval Attaché’s house until it was sold, for a considerable sum, in the 1980s. 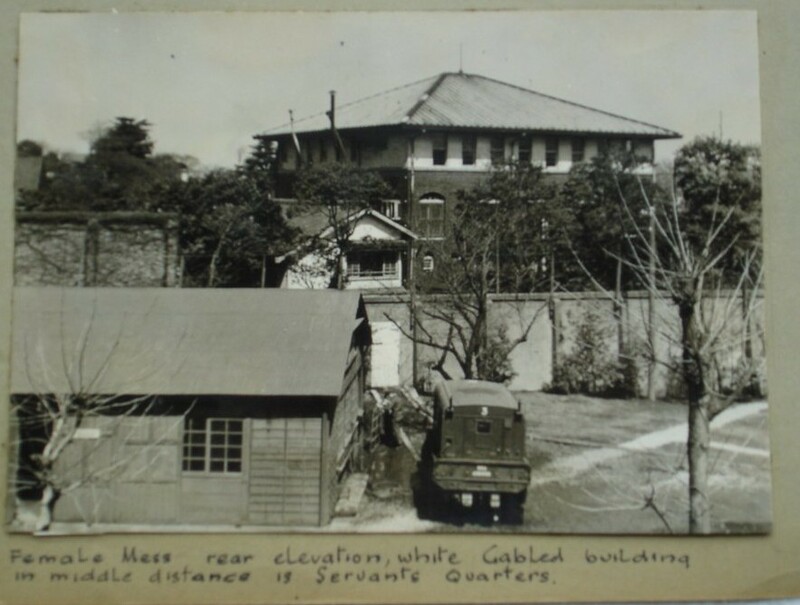 In 1962, a 2.6 acre site at San Bancho was bought for £50,000 with a view to demolishing its house and building new consular offices and staff flats. This development never happened and the site was later sold for a huge sum. 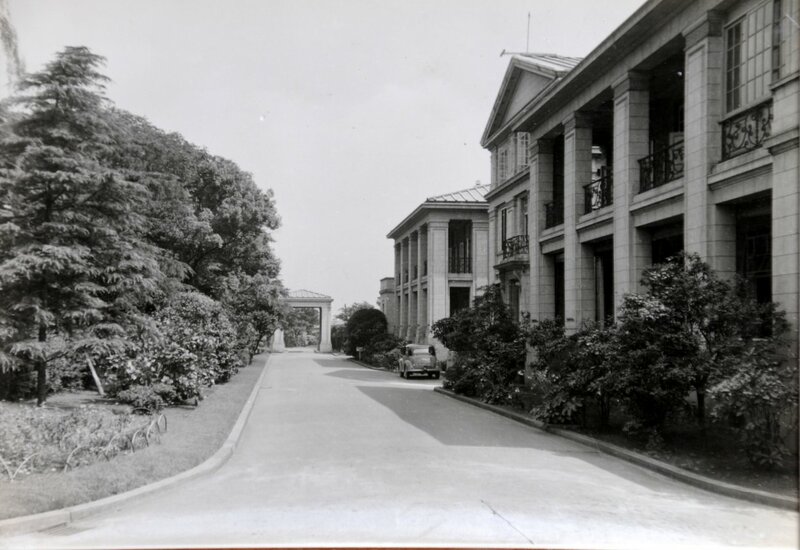 The controller-general of the Ministry of Public Building and Works visited Tokyo in late 1963 and concluded that the great costs of accommodating offices and staff off-compound required a reassessment of the long-standing view that the compound was already developed to its maximum. The first result of this change of heart was the erection of a pre-fabricated two-storey office building on the site of an embassy tennis court. It was completed in August 1967 and enabled the expensive lease for the consular section in the Sankei Building near Tokyo station to be given up. The commercial section took over this building in 1972 and the consular section moved once again, this time into the nearby Kinokuniya Building. Two years later, several other sections moved into the Diamond Hotel annex, just behind the embassy. Air-conditioning was installed in all the compound buildings during the 1970s. Radical arguments were under way in the later1960s about extensive demolition of compound buildings and their re-provision to a much greater density. Some absurdly ill-judged redevelopment schemes were proposed by Ministry architects. Even the residence was threatened. The ambassador, Sir John Pilcher, ended his defence of it to the secretary of state on 20 June 1969 by saying that ‘Japanese who come to my house say they have taken a trip to a country house in Oxfordshire. Why destroy so happy an illusion?’. A senior Ministry architect, James Truscott, produced in 1969 a reasonable scheme for junior flats, based on ideas for partial redevelopment of the compound that had been around for some time. Treasury had agreed that 24 flats could be built for junior staff but there was no agreement on its siting. The embassy, fearing more piecemeal insertions, argued with reason that any flats project should be part of a long-term development scheme. Michael Cary, permanent secretary at the Ministry, concluded his visit to Tokyo in July 1970 by drawing up a ‘concordat’ with the ambassador. 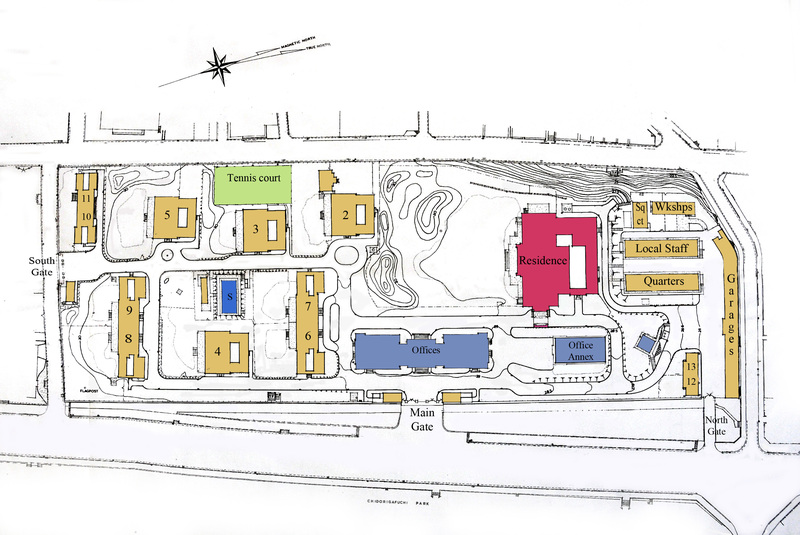 Its development intentions included: at least 12 junior UK staff flats on the Ladies’ Mess site; 16 UK staff flats on the compound near the south gate; a new Chancery building north of the ‘temporary’ office building; new Japanese staff quarters in the north-west corner; and the modernisation of all the staff houses on the compound. Were this to be carried out in full, only 28 of the 70 UK staff would need to be housed in local hirings. Sir John Pilcher was perhaps the last ambassador in the world not to have an office in the chancery but to work exclusively from his study in the residence: Sir Frederick Warner, who succeeded him in 1972, decided that the time had come to fall in line and an office was carved out for him in the middle of the upper floor of the chancery building. In the event, none of the 1970 intentions was carried out because money was short and there was no steam behind the proposals. 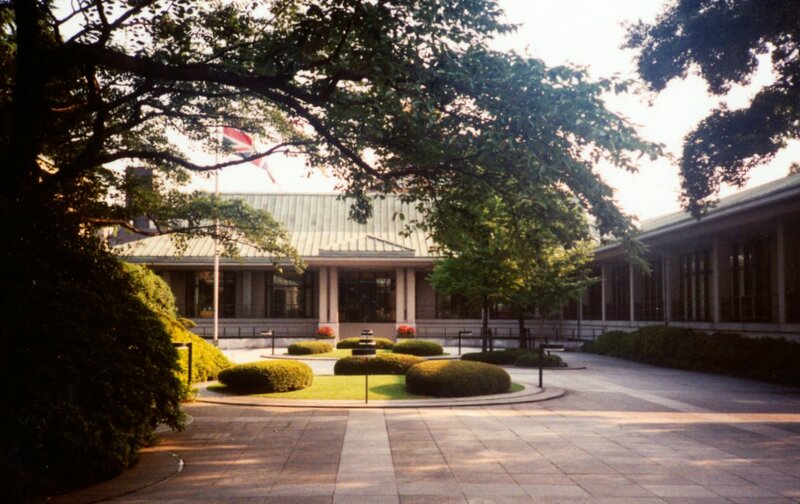 Instead, the London-based architectural firm of Powell and Moya was commissioned in 1974 to design a scheme for redeveloping all that part of the compound that lay north of the residence: they were somewhat familiar with the compound and with Japan through their earlier commission for the successful British Pavilion for the 1972 Osaka Expo. The embassy brief was for about 6,000 square metres of office and ancillary accommodation, 35 flats for locally employed staff, and underground car parking for 60 cars. Powewll and Moya’s solution was a five-storey square block, with its floors stepping a little outwards as is rose, surrounded on three sides by one or two floors of ancillary accommodation. The staff flats behind were stacked up to four floors in a dogtooth plan, served by access balconies, above two floors of carparking, workshops and storage. 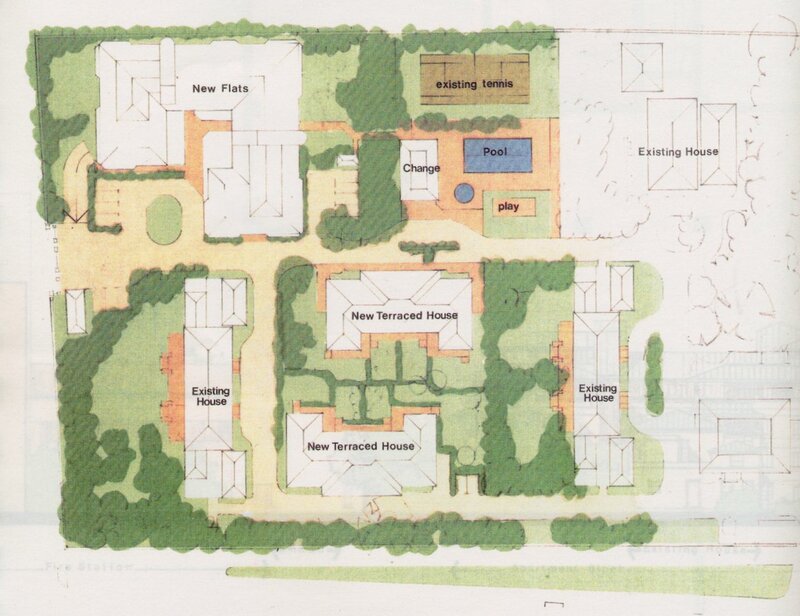 The scheme envisaged moving the formal compound entrance northwards to almost opposite the residence entrance, and providing a new staff and service entrance on the north end of the compound to feed into a carpark at sub-basement level. The elegant sketch design held much promise but the project was abandoned in the 1976 moratorium and never resurrected on the same scale. Instead, soon after the FCO took over responsibility for the diplomatic estate from the Property Services Agency in 1983, the new Overseas Estate Department (OED) set up a three phase programme for rationalising the compound. The first phase comprised an extensive upgrading of services. 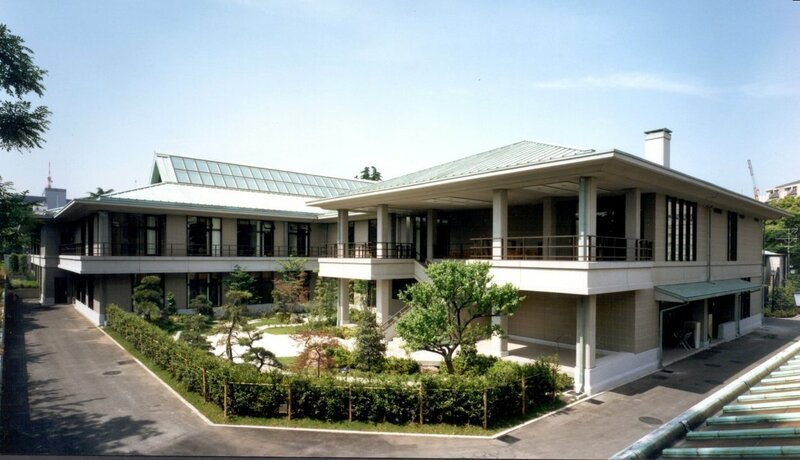 The second phase was the design and construction of new offices for the commercial, consular, information and scientific sections of the embassy, including a multi-purpose hall, at the north-east corner of the compound. One of OED’s in-house architects, Kenneth Campbell, was charged with this design. The fine and thoughtful resulting building, with Fukuwatari and Associates as executive architects, was completed in 1988. It enabled the 1967 pre-fabricated building to be demolished, and all the off-compound office leases to be given up. The third phase was to provide additional residential accommodation for both UK and LE staff. The Percy Thomas Partnership was commissioned to design a suitable block for about 20 flats towards the south-west corner, but the structural engineering system selected for the proposal proved insufficient for the level of earthquake resistance required and the scheme was set aside in 1988. OED produced an in-house proposal of its own by Francess Easmon in 1989 but the Treasury was insufficiently convinced by the economics of the case to defeat the Post’s resistance to the scheme, and that scheme was abandoned in the mid 1990s. 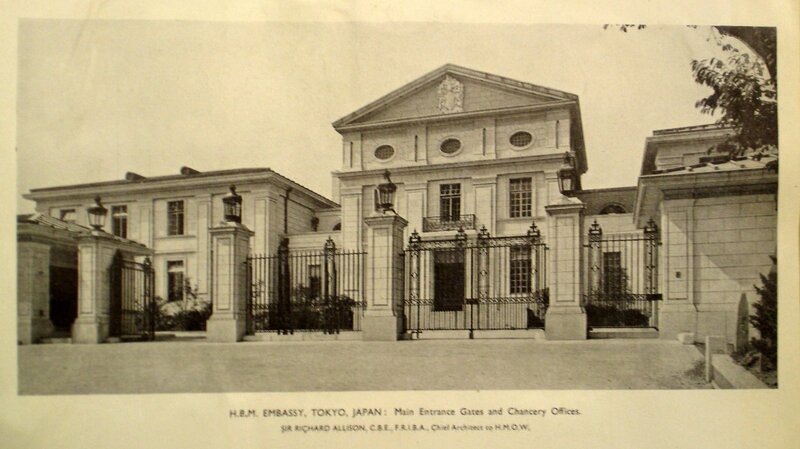 The rest of the twentieth century was pre-occupied by how to tackle the distortions that the Tokyo property boom had created for the future of the embassy compound. The FCO’s interest in the compound had no realisable value in the open market. Its value to the FCO was represented by the money that it was saving by not having to rent the accommodation elsewhere (i.e. its existing use value): this was assessed by its surveyors at about £55 million. But the compound’s value in the open market if it was not encumbered by the FCO’s perpetual lease was assessed at about £430 million. On the other hand, the market value of the freehold to the Japanese Government, with FCO as an entrenched tenant disinclined to pay a market rent, was probably no more than £5 million. Neither the Japanese nor British government could solve this conundrum without the consent of the other. The only way to release any of the enormous latent asset value was through a marriage value deal: that is, agree a course of action and share the benefits. Published completion photo of residence, 1933. Looking south past garden side of offices to residence entrance. Rear view of ladies mess, 1952. 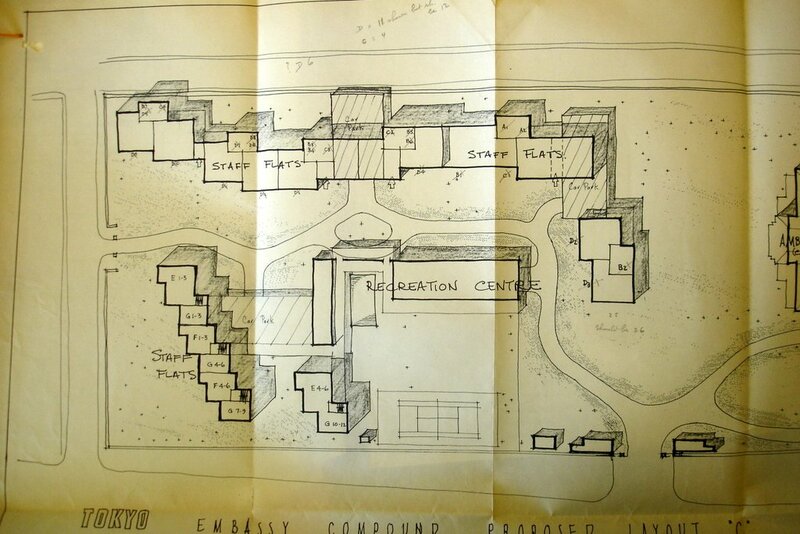 A 1969 Ministry proposal for the development of the south half of the compound. 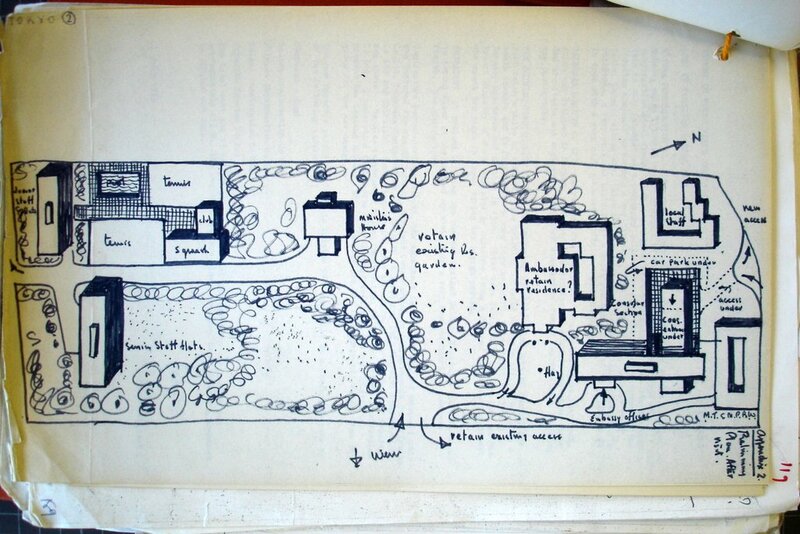 More 1969 radical layout ideas. 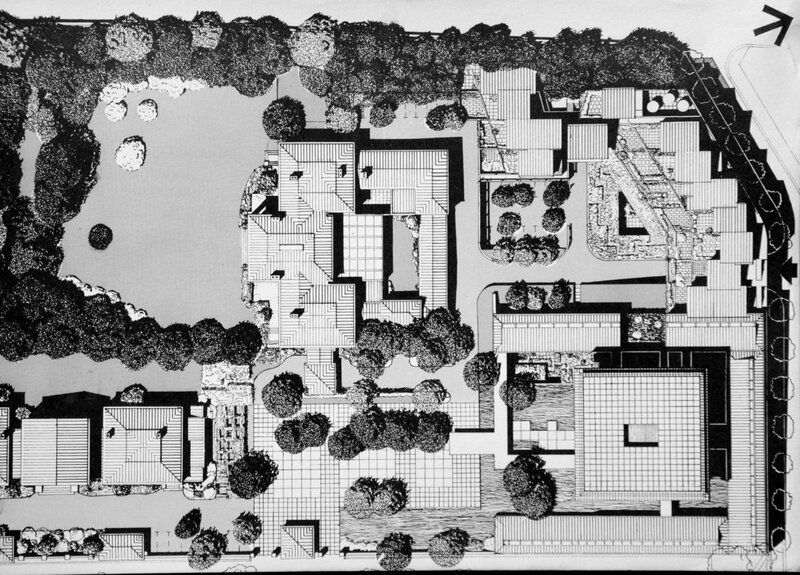 Powell and Moya’s 1976 proposal for developing the north end of the compound. New offices in compound by Kenneth Campbell, completed in 1988. Entrance to new offices. This forecourt, with the residence entrance to the left, was the former site of the 1967 pre-fabricated building. 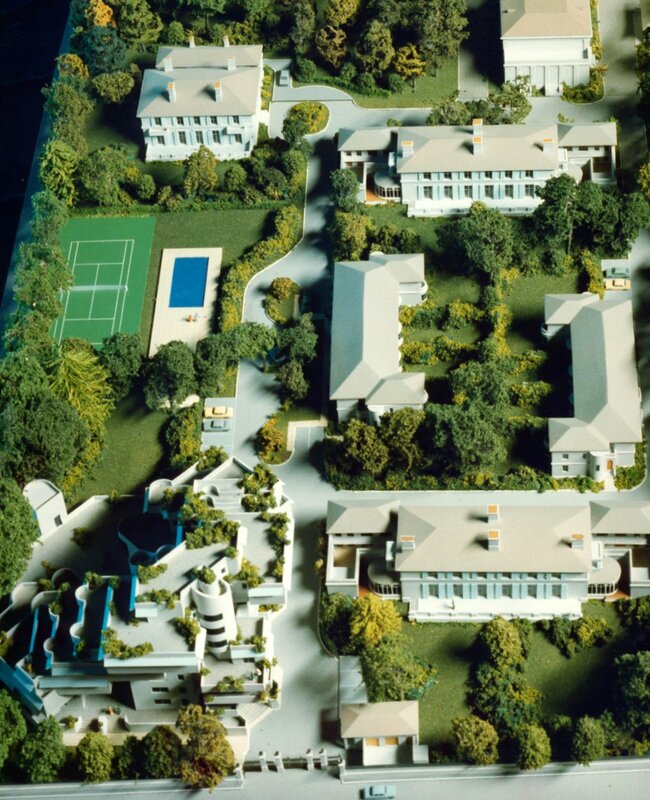 Percy Thomas Partnership proposal for UK staff flats at southern end of compound, 1988. Overseas Estate Department’s proposal for UK staff flats, 1989.